Busing is only available to students registered and living within a school’s catchment area. Throughout the school year, 84 school buses safely transport more than 5900 SSRCE students to and from school. Safety on a school bus is essential and everyone including drivers, students and families has a role in ensuring school bus safety. 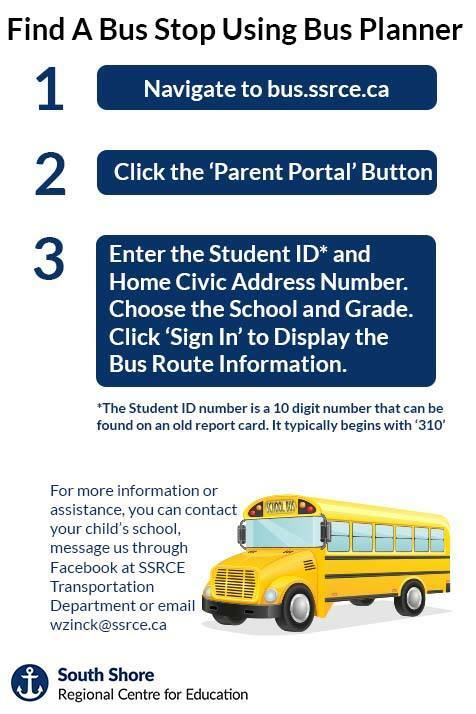 Click Parent-Guide-2018 for the Bus Safety Information. Also, please check out the Frequently Asked Questions document on School Bus Seat Belt Safety HERE. Click the link below to determine what school your child(ren) would attend based on your address. You can enter your home address and be shown what schools are in your catchment area (colour-coded). If you are new to the area or looking at a home on the South Shore, this map is a great resource for your planning! On June 22nd 2011, the South Shore Regional School Board passed a motion (MOTION094-11) to dedicate the New Germany /Park View Gray Area highlighted on this map to New Germany High School. This area formally known as the “Pine Grove Gray Area” was grandfathered at the time for current Park View students to allow the students who were registered at Park View Education Centre to continue their schooling there until 2013. As of September 2014 students who reside in this area will no longer receive transportation to and from Park View Education Centre and will be required to attend NGRHS unless their has been an approved transfer for any students to attend another school. Remain well back from the road until the bus has stopped and its loading doors are opened. Board the bus in a single file, without pushing or shoving. Older students should allow younger students to board first. Sit in their seat (assigned, if application) immediately after boarding the bus and remain seated whenever the bus is moving. Treat each other with respect. Teasing, name-calling and foul language are not acceptable and will not be tolerated. Ask the driver’s permission before opening a window. No part of the body may extend outside the window. Keep noise levels low so the driver can concentrate on driving the bus. Use the utmost care when carrying objects such as music instruments and skates onto the bus, so as not to injure other students. Only items allowed on school property are permitted on school buses. Carry on items must be stores in a canvass bag and be small enough to fit on the student’s lap or on the floor, between the student’s legs. Keep the aisles clear of all obstructions – books, lunch boxes, legs and feet, gym bags, backpacks, etc. Unacceptable behaviour is anything which could endanger safety. Drivers will report any disciplinary problems on their buses to the school principal, who will determine what disciplinary action will be taken and will advise the student and family accordingly. The principal can temporarily suspend students from riding the bus and, for continued misbehaviour, may permanently withdraw bus privileges. For questions regarding discipline of students, or concerns or persistent difficulties with a bus driver. For questions about bus stops, routes or back road closure plans.